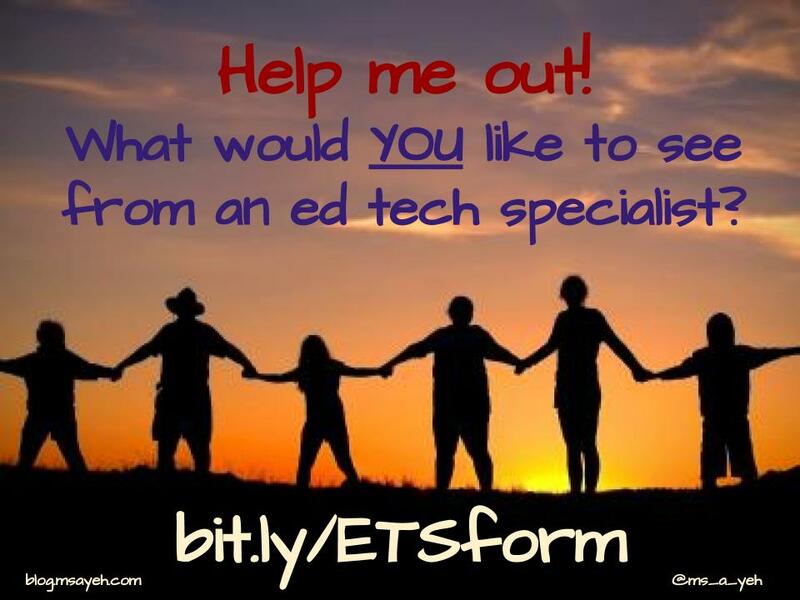 Adventures of an (Interim) Director of Fine & Performing Arts: Ed Tech Specialist: Looking for feedback! Hey, #PLN - I need your help! I am really excited that, heading into this school year, my team is changing the structure of how we spend our time. This will mean more time in schools and less time in offices! My mind is overflowing with ideas for what this could look like, but I know that many minds are better than one! To that end, I put together a form to collect ideas/feedback - if you don't mind taking a couple of minutes to fill it out, it would be appreciated! I will have 13 schools (7 elementary, 3 K-8, 1 middle, 1 high, 1 K-12) I am supporting. I will be in schools Mondays & Fridays. There is the possibility of going out on other days of the week, but only as time allows. For the most part, our district do not have building-level instructional coaches or technology teachers. There are TOSAs for different subject areas that work with multiple schools. This type of support has not been available before through our department, so it may feel pretty new! Thank you in advance for the power of crowdsourcing ideas - I will share the feedback on here after a few weeks!